We would like to introduce you to our Discover Movement Coach Esa Zhang, who is working with some of the best gymnasts in the world, in China. His role with the elite Chinese gymnasts involves both physical preparation as well as injury prevention and rehabilitation. This blog is a short snapshot of Coach Esa’s coaching philosophy and the training environment he operates in. Coach Zhang has extensive background in various strength and conditioning methods and body work techniques. He is originally from Finland but moved to China with his wife and children in 2013. After moving to China, he has had unique opportunities to coach elite athletes and teams including the China Women’s National Basketball Team. Coach Zhang applies Discover Movement’s 368-Training System with his gymnasts as the foundation for improving performance. He analyzes and develops the physical characteristics of his athletes in a way that takes all three planes of motion in consideration. Coach Zhang builds a comprehensive profile of each athlete from head to toes looking at all the anatomical stations of the body as well as the movement chains that tie the stations together in an integrated and functional way. But he also adds to the system his knowledge, experience and tools, such as soft tissue work, injury rehabilitation and various methods of movement training. The systematic approach allows Coach Zhang to operate from basic foundational concepts related to human body and to apply them in on an individual level. It also reminds him to always consider the big picture when it would be tempting to train or treat just a body part instead of the whole athlete. As many have noted, maybe the most important ability and athlete can have, is availability – availability to train and compete. Pain and injuries keep an athlete from being available and getting better. For any gymnast to achieve their potential and success, he must be able to consistently train and improve. For an elite gymnast, the quantity of training is extremely high and the possibility of doing too much is always a real risk. How much can you practice and not break? We know, that in order to have long-term improvement the athlete needs to recover from training and to avoid acute stress and load from becoming an injury or a chronic state of unavailability. The strategies that Coach Zhang has successfully used to help athletes stay healthy are, to name a few, variety in movement training, monitoring recovery and tissue health through manual therapies. For any approach to be successful it needs to be targeted based on the individual and the activity itself. Sometimes the training strategies are chosen to enhance a movement, for example, through biomechanical specificity, in which case the training might directly aim to influence sport performance. Other times, and often with gymnasts, the complimentary training in addition to the sport practice is designed to de-load the gymnastics and provide the body with different movements and variety, that could be called ‘active recovery’ or ‘reverse exercise’. Because any movement repeated over and over can eventually affect general health and athleticism negatively, Coach Zhang likes to provide his athletes exercises that ‘break the mold’ of gymnastic movements. This is an indirect way to improve sport performance while directly influencing the athlete health and recovery. The most important training tools for Coach Esa are found anywhere as he likes to utilize open space and athlete’s own bodies in order to take advantage of Gravity, Mass and Momentum and ground reaction forces. His knowledge of the human body in functional motion is the secret weapon when programming the training. What it comes to equipment, Coach Esa prefers to use free weights, pulleys, bands, kettle bells and medicine balls to name a few. The training and coaching mostly takes place in the training center in Beijing. Many of the Olympic sports are represented there and the teams prepare for the next big competition, many of them already turning their focus slowly, but surely towards Tokyo 2020 Summer Olympics. Coach Esa has a great view of the preparation of some of the best athletes in the world. He steps on this stage every day with humility and true concern for his athletes’ well-being and success. We are proud to have him in the Discover Movement team and pray for wisdom and favor in his work now and for years to come. "Every day is a game day"
When you woke up this morning, did you feel READY for the day and its physical challenges? If you asked me that question today, I would have said YES. But then again, yesterday I would have said NO. What was the difference? Did something suddenly happen to my fitness level over 24 hours? The difference lies between Preparedness and Readiness. You might have prepared (=trained) for the big day for a long time, but it is just part of the equation – you also need to be READY, when the gun goes off or the whistle blows? The Olympians in Rio at this very moment know this paradox all too well. You can be ‘prepared’, but not ‘ready’, when it matters the most. Preparedness and Readiness are terms made more understandable and scientifically available by scientists behind physiological tracking systems such as Omegawave. Omegawave tracks various physiological systems and their readiness at the given moment. To give you a quick illustration, here is my result from yesterday and the day before. The Windows of Trainability give you an idea of which systems are ready for development and which ones require more recovery before they are ready for a new developmental stimulation. The concept and the principle of Preparedness vs. Readiness is a great help in optimizing each training session, whether you have access to technology or not. Just understanding the fact, that sometimes (maybe often) recovery is your best workout for getting better. And learning that sometimes (maybe often) the athlete who is more READY wins. And you can almost always improve Readiness, even when its not possible to improve Preparedness. Here is my Omegawave reading 25 minutes apart with some relaxation in between, both before the workout. While understanding that sometimes technology can give us false readings and assumptions, I would always prefer the latter state to build fitness and performance on. As the founder of EXOS performance Mark Verstegen would say: “Every day is a game day”. Get prepared and be ready! Where are you going and what are your 'movement tasks'? In the pursuit of improving human movement abilities (function & performance) it is vital to identify a few important landmarks in order to establish the starting point, direction and distance to the goal and the key navigational factors for planning the route. Basic questions, such as ‘where do I start from?’, ‘where am I going?’ and ‘how do I get there?’ are reasonably simple, but often overlooked inquiries that could help us to our goal by guiding us towards the most optimal path in terms of effectiveness, safety and speed. If our goal is within the realm of movement (life and/or sports), we probably have a desired ‘task’ in mind, an activity or a specific motion that we would like to enhance, improve, upgrade, repair or ,just simply, make better. The desired task is clearly one of our main landmarks on the map of better movement. The less visible the landmark of the task becomes on our journey, the easier we might get lost and confused in regards to our goal and the path to our destination. The better we understand the task in its relationship to our bodies and to our environment, the better our planning and execution of the journey can become. The task can be evaluated, for example, based on the WHYs, HOWs and WHOs. HOW = How does the body execute the motion? What is the chain reaction in our movement system that the given task initiates? 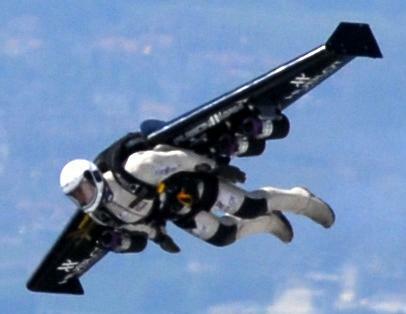 What is the role of gravity, ground reaction force or momentum? 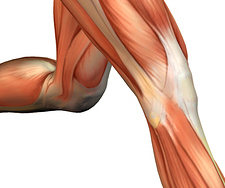 How do the body parts function biomechanically during the movement? WHO = Who is performing the task and what are his or her individual characteristics of producing the movement? Where are they the most successful and is there potential for improvement? Maybe there is pain involved…? Or is it possible that the task is influenced by psychological or behavioral factors? As you might notice, assessing the task and its variables might easily become quite complicated. However, the actual training and conditioning can be made simple and inspiring once the initial brainstorming is done. One of the objectives of Movement Map is to simplify the evaluation and the training of the given task. By using the principles of Applied Functional Science AFS and with the help of Movement Map, we are able to establish the key landmarks of the movement and direct our training resources in the most efficient way. Thank you for your time and remember to enjoy the journey, whatever the goal! What really happens in sports? How to train for the true demands of a given sport? How to create an authentic environment, where the body can be prepared for a competitive and aggressive movement task? What kind of positions, angles and forces are present when catching, evading, dribbling or changing direction? Does the knee always point to the same direction with the toes? "“A ship is safe in harbor, but that's not what ships are for.” William Shedd. 368 Training Systems -principle: Always train all planes, stations and chains! 368 - Training Systems answered to my own need of developing a system that makes the complexity of human movement a bit more simple to put into practice in terms of training and conditioning. 368 concept is inspired mainly by three wise men, Gary Gray, Thomas Myers and Gray Cook, the mentors that have made the dynamic miracle of human movement a little bit easier to understand for a coach/trainer such as myself. 368 gives me a tool through which I can observe movement and be reminded of its dimensions when planning exercise protocols and coaching athletes. How does 368 help me in practice? 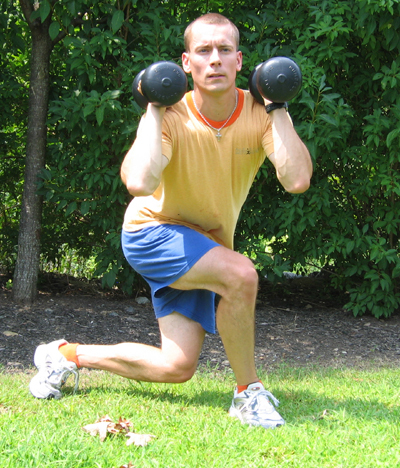 Here is a an example of that; 3-D lunges combined with upper body patterns (medicine ball). This sequence is can be used for training the chains. Active and dynamic warm-ups and movement preparation routines are replacing the old and the mentally and physically more passive warming up practices. 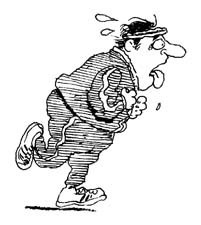 The general idea of (just) elevating the body temperature by slow jogging followed by a few static stretches is being revolutionized by a more focused and involved movement preparation. An athlete spends between 10-20 minutes a day preparing the body for the competition or practice. This time accumulates slowly but surely and functions not only as a primer for the sport performance but as an opportunity to learn and develop various motor skills. The activation of the movement system correctly prior to sport performance or practice has been found crucially important. Discover Movement has been researching and developing optimal warm-up and movement preparation protocols for years. A systematized approach helps the coach and the athlete in practical execution of the warm-up. The correct sequence of the phases also improves the results gained from the active warm up routine. The objective of the system is to elevate the body's ability to provide a desired training stimulation and ensure that the provided training transfers into a training adaptation. Thus, the dynamic movement preparation should improve the absorption of training on neuro-muscular, cardio-vascular as well as metabolic levels. Discover Movement Dynamic Warm-up consists of six phases that are designed individually for each athlete's goals in mind. The following gives a general idea of the dynamic warm-up sequence. Each athlete and each sport requires often slightly different warm-up exercise routine. CONTACT us for help in designing the optimal dynamic warm-up routine for your athlete or team. I learned some fantastic locomotion patterns from Todd Wright from the University of Texas basketball program. As a part of the dynamic warm routine it important to stimulate both the mind and the body and even the spirit. These movement patterns will do exactly that, they will challange the coordination, make you focus, build your athleticism and make you laugh in the process. Here is a short sample of one locomotion pattern called skippioca, which combines the movements of carioca and skip. Try them out. I felt ridiculously uncoordinated myself in the beginning but I am getting better and so are my athletes. PS: Coordination is the act of coordinating, making different people or things work together for a goal or effect. Wikipedia. I remember it like it was yesterday... I attended a functional training seminar several years ago and saw Mark Verstegen present on the subject of Movement Preparation and Dynamic Warm-up. It was not like I hadn't tried or heard about it before but during those hands-on workshops my eyes (and my hips) opened to see the potential of an optimal activation and preparation sequence of the movement system. The "worlds greatest stretch" was an essential part of Mark's movement preparation sequence. It was one of those concepts that got absorbed by my brain and my body very well. Several years now, some of the same dynamic flexibility sequences are still in use in our programs and they are still producing the desired results of increased active range of motion and activation of the correct muscle groups prior to training or sports. These five Discover Movement dynamic warm-up videos are the most popular based on the overall views on Discover Movement channel on Youtube. Click the links below to view the blog entry and the weekly warm-up video. Also, don't forget to take an advantage of the Dynamic Warm-up guide that is free for the readers of this blog. You can download yours here. Stay tuned for more weekly warm-ups! PS: What sport would you like to see a dynamic warm-up for? Let me know. Thanks! How many times and with how much power a tennis player hits the ball during the game? What is the true impact of a golf swing on the shoulders and arms? In how many different positions a goalie of any sport has to demonstrate upper body strength and stability while receiving the forces of a fast flying ball or a puck? These are the questions that I am pondering when designing exercise programs for athletes of specific sports. I try to go through a process of analyzing the upper body movements and the arm positions that my athletes need to be able to generate force through. Today's weekly warm-up is a demonstration of speed ladder exercises for the upper body. It is a mix of shoulder stability and upper body plyometrics. Take care and brace yourself for impact! 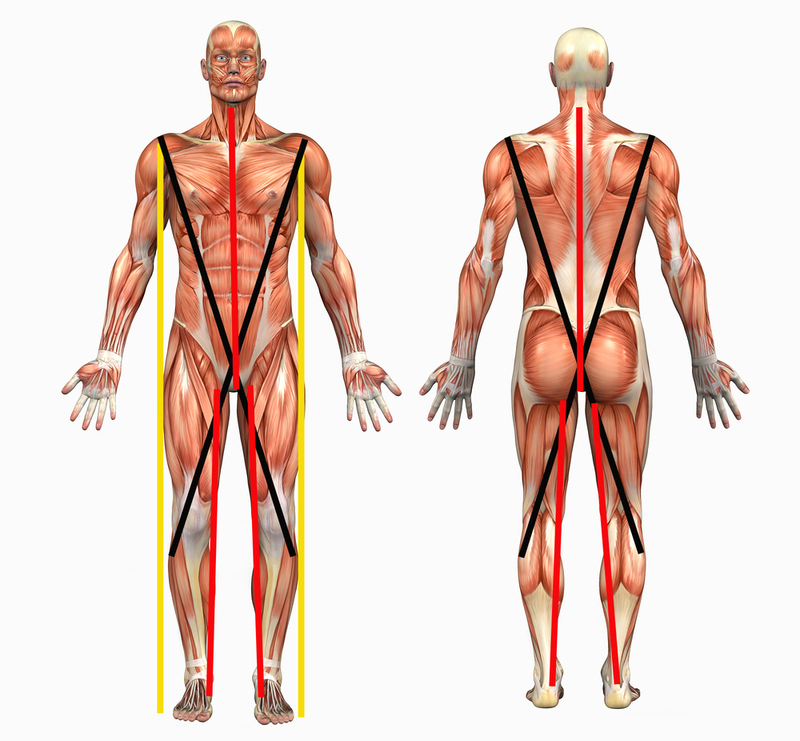 Some of the most powerful anatomical and neurological linkages within the body are crossing over the body's center line. They are involved with rotational movement patterns. Most movements that require power in sports are rotational, such as running, throwing, kicking or punching. So how to activate the essential muscle connections that are involved in rotation? In other words, what kind of exercises might help us prepare for rotational sports or even for a functional conditioning workout? 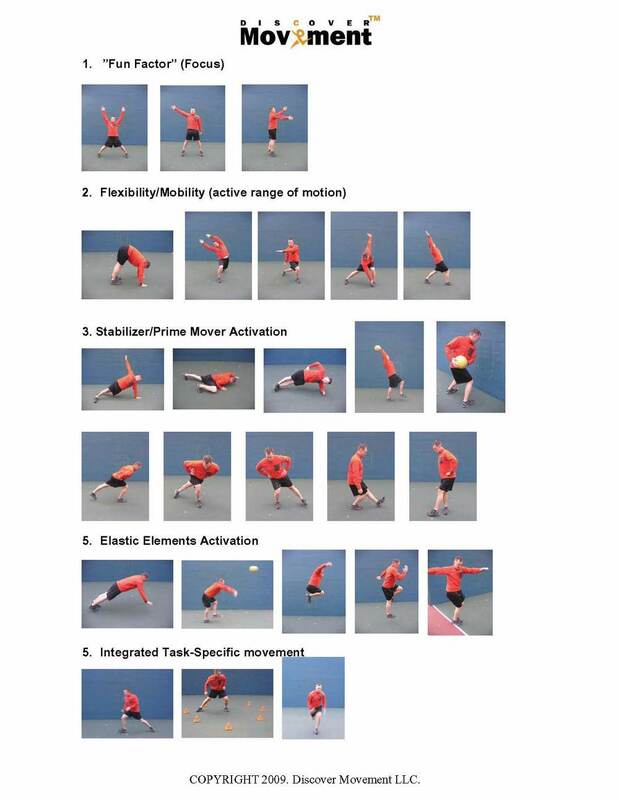 Here are some of the rotational medicine ball wall throws that we really like as a part of the dynamic warm up. Recommended reading for accurate anatomical descriptions of the myofascial connections: Anatomy Trains by Thomas Myers. PS: Check out Discover Movement Facebook page and become a friend! Why do the back-related pains and injuries often occur in the context of low-intensity, miniscule tasks, like picking up a pen from the floor? Why didn't the musculature around the spine suddenly brace and support the lumbar region the same way as it did when doing crunches, deadlift or squats at the gym? Based on all this, I have to ask myself the following. Do my training and conditioning practices include exercises that prepare the body for the unexpected (read: life, sport) or have I just created a nice setof beach muscles that only contract when I flex them? And if so, what kind of training would "heal" this only-contract-when-told-by-me -syndrome? One of the practical answers in creating involuntary abdominal stimulation is THROWING. Throwing movements are task-specific exercises and create same involuntary contractions to support the spine. However, in order to avoid too familiar and too voluntary training, we should probably perform these exercises in a variety of ways and in multi-planar fashion to create an environment that would simulate a reactive sport or a true life situation. Various medicine ball throwscan function as true and functional abdominal training. Here are some of the basic throwing movement patterns. Progressions include for example: A) A narrower base of support (1-leg) B) Combinations tasks (jump and throw) C) Load, distance and accuracy variations. Hurl, cast, toss, fling, thrust, slam and have fun! PS: "Don't throw away the old bucket until you know whether the new one holds water." Swedish Proverb. Does your sport involve rotation? If you answered no, I would like to ask for a permission to prove you wrong. Why such an overly confident attitude about the issue? Training the component of rotation is crucial as is of course the ability to eliminate rotation at times. Life is a rotational activity! "The more boring the exercise is, the more effective it must be. " "Games and drills are for recreational use only, not for real athletes. " "Focused athletes do not have fun while training for serious goals." PS: "The only way a kid is going to practice is if it's total fun for him... and it was for me." How many different kind of jumping jacks can you do? = A total body warm up! Here are some great samples from Kouvot Development Group. Now come up with your own jumping jacks!